Looking for someone to take care of your website? We have built many websites for clients over the years, but that's only half the story. Remembering the first company we built a website for, we are proud to say that they are still a customer we work closely with over 10 years later. Building a long lasting working relationship is as important to Cirencester Web Design as building a website. Long lasting relationships with happy clients is what makes them recommend the services of Cirencester Web Design to others. This is why many of the clients we have worked with over the years have resulted from a "word of mouth" recommendation by an exisitng client of ours. So not only can we build your website for you, we will be around when you need us for website maintenance too. Clients have a choice of taking a "pay as you go" maintenance where they pay as and when they require website changes, or taking a website maintenance contract which gets them a pre-defined amount of our time per month to carry out website maintenance tasks. And we don't just offer website maintenance services for websites we have built. 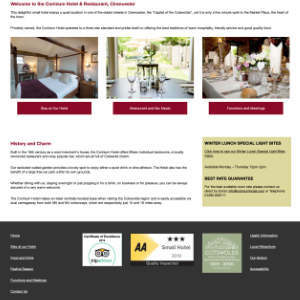 If your website was built by another company but you have decided you need someone else to take over the maintenance of your website, then Cirencester Web Design will be happy to discuss your requirements.